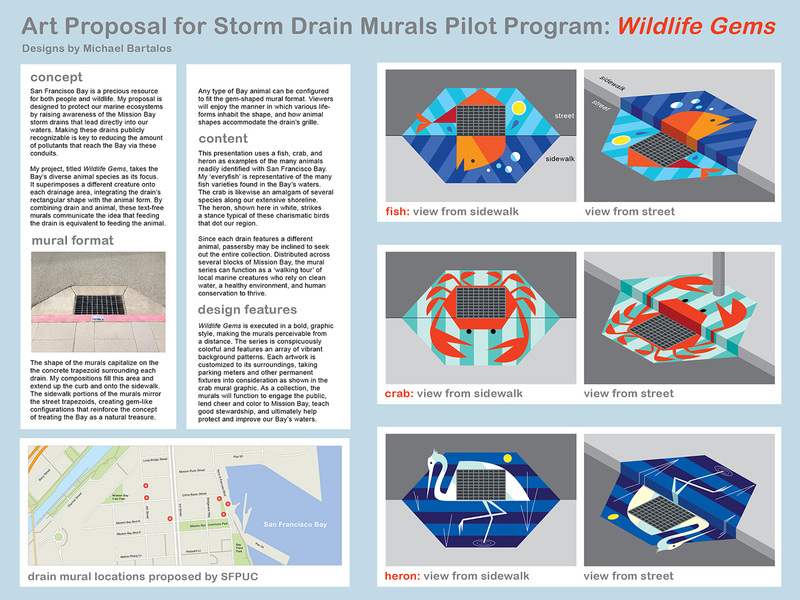 I’m one of the shortlisted artists for a new public art opportunity as part of the San Francisco Public Utilities Commission’s (PUC) Storm Drain Murals Program. Under the pilot program, the PUC and the San Francisco Arts Commission will implement a series of temporary murals on sidewalks and pavements adjacent to six storm drains in the Mission Bay neighborhood. The goal of the program is for visually impactful graphics to promote awareness of storm drains that are separate from the sewer system and lead directly into the Bay’s waters. Making these drains publicly recognizable is key to reducing the amount of pollutants that reach the Bay via these conduits. Click the image above for a look at my artwork proposal. The presentation board is also on display at the Mission Bay Branch Library through September 16 as well as on the SFAC website.